Jenna was working away at her philosophy degree at Queen's University in Kingston when she decided to shift gears and head into her salad days in the new family business. Younger brother Justin, 22, is the vice-president of Canadian development. He works on setting up stores and training staff and potential candidates to run the burgeoning franchises. "I never saw myself doing this but now I see myself running a restaurant," she muses. Brenda Bot may be the only woman ever to shed 140 pounds and gain a fast food restaurant chain. It all started a few years ago when she and her husband decided to toss the greasy cheeseburger and French fries habit and opt for lighter fare, long walks and loads of lettuce. Then a light bulb went on when she and her daughter Jenna took a trip to Florida last year and stumbled upon Salad Creations in a shopping mall food court. It's fast food with a healthy twist, where you customize your own salad with dozens of toppings very quickly at the counter, much the same way as subs are made. "We thought: ‘this is great. It looks like the Subway of salads. There’s no reason we can't do something like this in Canada. People want to have healthier choices,'" says Bot. That inspiration began a life-changing transition in her career, just as her weight loss journey was for her health. For the past 20 years she and her husband Glenn, a civil engineer, have been running Nor Eng Construction & Engineering Inc. in her hometown of Sudbury. "Even if you asked me two years ago, I never would have said I saw myself in the food business. My background is not in food at all," giggles Bot, who looks fit and trim as she nibbles on a junior Greek salad at the Salad Creations she opened earlier this year on Yonge St. just south of College St.
Sure, the concept is cool. But everyone wondered: Isn't it super risky to start a new business in a deep recession, let alone in the fickle restaurant world where eating spots can open and close almost overnight? Plus, there is no shortage of competition nearby including from Freshii, a chain with similar offerings like salads, soups, wraps and frozen yogurt with the same ‘build-your-own’ concept. But just as Mr. Sub has competitors that put their own spin on sandwiches including Subway and Quiznos, Bot had faith there was room for her version of customized salad making and hearty yet healthful eating. She got the skinny on how to move Salad Creations – an established brand with dozens of outlets in the U.S. – to Canada and make it her own. "When I do something, I do whatever it takes to make it happen. I just engrossed myself in learning about everything to do with this business," she explains. "I have a passion for this and I really love the idea." 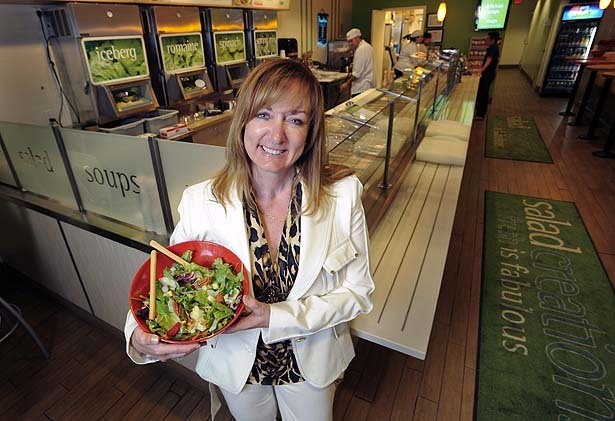 Bot bought the rights to the brand last winter and is now the president of Salad Creations Canada with an agreement in place for a 50-store rollout across the country. The scheduled opening next month of the second Toronto location in the Sun Life Financial building at King and York streets has been delayed due to the Toronto civic workers' strike, which has put a roadblock on commercial permitting for now. Other locations set to open this year include the food court in the Erin Mills Town Centre and one in Brampton. Next year Bot will focus on developing Alberta; after that she has her sights set on big city centres across Canada. Her blossoming chain is considered separate and distinct from the large U.S. franchise, so she could put her signature on the brand at her flagship store. Restaurants here have different menu items to cater to Canadian tastes. "We get a lot of vegans, too, so they are looking for something different and very flavourful. Our soups sell out every day," she says, adding the grilled tofu and coconut curry are a big hit. The Yonge St. location is decorated in bright green for obvious reasons, with menu items listed on the wall along with big pictures of fresh vegetables everywhere. Customers will see a picture of a big tomato with sunglasses to signify the new summer-inspired salads on offer. Daughter Jenna, 24, is always busy tossing and chopping behind the counter as the operations manager and is also the creative inspiration for most of the menu. She isn't keen on creations with thousand island and ranch dressing, preferring balsamic and sun-dried tomato concoctions, which she notes are the preferred Canadian salad dressings. "I've always had a passion for food," says the wispy and energetic cook. "You can ask my boyfriend. All I do is think about food." She's also a Food Network junkie. "I idolize Giada De Laurentiis" who hosts the television cooking show Everyday Italian, she adds. Jenna was working away at her philosophy degree at Queen's University in Kingston when she decided to shift gears and head into her salad days in the new family business. Younger brother Justin, 22, is the vice-president of Canadian development. He works on setting up stores and training staff and potential candidates to run the burgeoning franchises. "I never saw myself doing this but now I see myself running a restaurant," she muses. "There's junk food everywhere but I think more people are eating healthy these days." Salad Creations is green through and through from the lettuce right down to the biodegradable packaging. Customers who eat in the store have real cutlery and dishes, with big red bowls for the salads and metal baskets for the wraps. Salads are tossed or chopped – literally with a double-sided pizza slicing wheel – in big stainless steel mixing bowls. Bot says business is good and that they're about to get into catering big time. The Star. How much seed capital did you have when you launched the restaurant chain and where did you get it? Brenda Bot. We put aside over $1 million dollars as seed capital. This came from prior businesses. Q. What's been your biggest success/failure so far? A. I believe our biggest success is taking a brand that was typically known as a ‘quick service restaurant’ and elevating the brand to ‘fast casual,’ while taking the flavour profiles of Canadian guests into consideration with a new look and new menus for Canada. A. Finding qualified franchisees. We are very selective in finding them and we have stringent criteria. They have to mesh with the brand so we do a very thorough review of potential franchisees.